Thanks for coming, Washing Machine and Bathtub. As you know, I've wanted to have a meeting of Things That Require Plumbing for a long time, and -- being a sink -- I couldn't come to you. Bathtub, I see you already have a copy of tonight's agenda. Wait... Washing Machine... who's that standing behind you? Dryer? Does Dryer require plumbing? No! Therefore Dryer shouldn't be here tonight! Man, you couples that go everywhere together creep me out. Dryer, could you wait outside please? Maybe Dryer is a natural-gas fired dryer? Natural gas requires plumbing - well, pipes at least. Are we going to discriminate based on what the pipes are carrying, be it water or natural gas? Do we want to exclude natural gas Stove also, just because its piping doesn't carry a liquid? Is this fair, I ask you? Those uppity appliances with water-based plumbing. Grrrr. too bad the dishwasher couldn't make it. I thought my house was odd for having a laundry chute in the kitchen (you know, for all those times you undress while cooking), but a tub in the laundry room -- GENIUS! Your commentary on this one is priceless. Certainly gives new meaning to "full bath". And I thought my bath was special because there's a hot water heater in the corner. If the dryer has gas, all the more reason to have it leave! Obviously, Toilet took the picture. BTW, Anon #2, my parents' house has a laundry chute in the food pantry! I think this is the most efficient "bathroom" I've ever seen! While in the tub you can wash your clothes ... brilliant! And when done bathing, clean clothes await you! My mind just can not compute such efficiency! Too bad there isn't a stove in there for some cookin' - what a shame. I think this blog is hilarious...but this caption takes the cake! I think I almost laughed so hard I leaked some fluids out of my plumbing...does that mean I would meet the eligability requirements to attend this meeting?? heh heh heh. Another gem, Sara. You're a star. I would think they were trying to show off the lovely wood work on the walls. But forgot that functionality comes before beauty. At least, I think it does for houses. I wish it did for people too! I have a comment about laundry shoots in kitchens; I'd love one! Back before plastic sponges and paper towels, people used kitchen rags and cloth towels to clean up. I started doing this a few years ago. I have to use a small garbage can to put them in till I cart them off to be washed. Is that a flood light in the socket overhead? i have been reading your blog for a few months now and this is the first time i've commented. i just want to say, thank you for making the water come through my nose and all over my computer screen. thank you. thank you. For the educational portion of the blog - condensation dryers (like the one I have here in the Land of Hol) require either manual emptying of the water tank, or plumbing to a pump to empty it automatically. *Sigh. * Nothing is easy here in Holland. At least my dryer can go to the meeting. This listing made my day! I saw it and flashed back to childhood, THIS IS THE HOUSE I GREW UP IN! It's actually nice, it has 2 fireplaces they didn't bother to take pictures of and a gorgeous view from the dining room of woods and a creek. 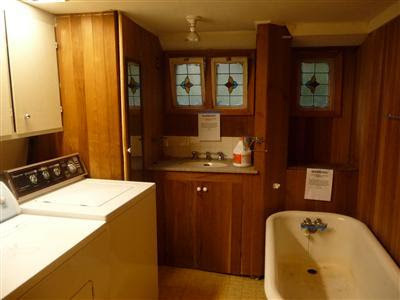 The leaded glass windows and cedar wood panelling in this photo were worth showing, but maybe they should have shown that it's a clawfoot tub rather than focusing on the crappy washer and dryer. I think this qualifies as an example of poor photo choice on the realtor's part. Seriously, a picture of the plywood workbench and not the fireplaces?! Wait wait wait. It's really your childhood home? This very house? That's nuts! Yes, it really was!! Small world, isn't it!? I recognized this as the downstairs bathroom because of the shelf over the back of the tub that had an aquarium on it and one time my sister and I decided the fish were dirty so we scooped all the fish out into our bubblebath to wash them. But they died anyway. :-( Then my parents got rid of the aquarium. Anyway I asked my mom and it WAS a natural gas dryer. So it did actually qualify for the meeting of the brotherhood of plumbed things! Dryer has an exterior vent, right? Just because the pipe doesn't carry water doesn't mean it isn't plumbing! I believe the term is spigots.